In our final ‘Smart Building’ installment, we look at how space utilization affects your organization’s 1) efficiency, 2) productivity and 3) profitability. To reduce the incidence of some lung diseases, employers are now required by OSHA to limit workers’ exposure to respirable crystalline silica. At an awards ceremony and luncheon held jointly by the Greater Des Moines Partnership and the Business Record, Baker Group was today presented the 2017 Economic Impact Award. Part V of our "Smart Buildings" series focuses on how building occupants' health, happiness & peak performance is enhanced through safety, security & noise-reduction strategies. Are Air Compressors Robbing Your Plant’s Profitability? In manufacturing plants, compressed air is as important as water, gas & electricity. But many compressors are wasting air–money. Discover paybacks of a compressed air energy audit. Baker Group awarded a 2017 Top Workplaces honor by The Des Moines Register. BJ Baker, Chairman and CEO, says, "Being named a Top Workplace reflects our day-in, day-out effort to live and breathe our core values." Just because an electrical box breaker is in the off position doesn’t mean there’s not live power behind it. Opening its panel and reaching inside could cause electrocution. Part III of our “Smart Buildings” series explains how your facility’s air quality and thermal health impact your building’s occupants – and your bottom line. Why RIGHT NOW is the ideal time to schedule your pre-season checkup for your heating system. Iowa-based Baker Group, a full-service specialty contractor, announces the promotion of Mike Lipp, P.E. to Electrical Business Unit Leader. Part II of our “Smart Buildings” series focuses on Ventilation & Lighting - two of the technologies that improve occupants' comfort, health, happiness and productivity. It's UV Safety Month – the perfect time to brush the perfect time to brush up on best skin-protection tips. We’ve got 10 of the best ways to protect yourself from skin cancer. 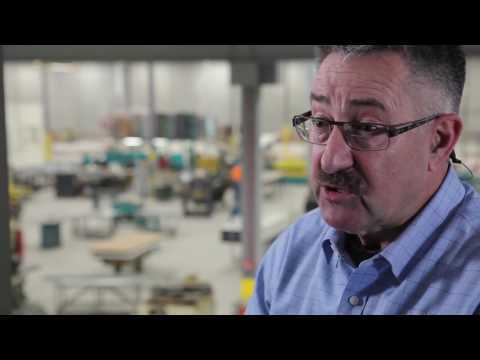 Baker Group’s Advanced Manufacturing facility in Ankeny allows us to prefabricate in a controlled environment increasing speed, quality and value for our clients. Each year, hundreds of people die from exposure to heat & humidity. And virtually every case could have been prevented. Baker Group works to make sure each worker goes home safely. As of January 1, 2020, the most common refrigerants for commercial HVAC systems will no longer be manufactured. Now’s the time to learn what’s changing, and why. Extensive planning, prefabrication and absolutely reliable execution were critical to complete this backflush valve replacement. Security Software Outdated? It’s Time to Update. In the past few weeks, security manufacturers released new versions of their software, rendering many security systems out of date. Baker Group can help update your systems. To help you protect your employees and comply with OSHA requirements, Baker Group’s team of certified safety professionals now offers safety consulting and training services. It’s Time: Check Your A/C Now! Baker Group is part of the team that is designing & building a very cost-efficient building that will help Holmes Murphy improve how they operate & the experience of their staff. Using more energy than you need is like throwing money out the window. Fortunately, there are low-cost ways to reduce energy waste and add to your bottom line. More affordable than ever, Building Automation Systems (BAS) aren’t just for big business anymore. Check out how the University of Iowa is leveraging Baker Group's capabilities in their newest, high-tech, energy-saving residence hall.